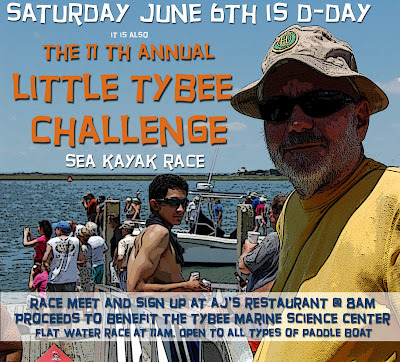 Probably the best little sea kayak race on the east coast. Short, fast, and fun, the race starts around high tide with a long straight down the Back River across to Little Tybee. It then gets interesting as the racers must negotiate narrow marsh creeks with lots of switch backs. Racers have been known to get lost here. Another long straight leg and then finally through the surf and onto the ocean. The weather here can be the biggest factor of the race as paddlers paddle along the front of Little Tybee before coming back through another surf zone. The last leg is against the tide back up the river. This race is very equipment and weather dependant, so a great equalizer for just about any kayak. One year I very nearly had my arse kicked by Dave Mason in a C1 Canoe !. Dave T, paddling a Thunderbolt, was once leading the pack only to be swamped and sunk in the first surf zone. Prizes and cold drinks for all who take part. and you're wondering how to get even more SC&K news, views, updates, and insights..
sign up now to receive our Email Newsletter! Be the first to know about upcoming courses, day trips, community events, discounted group rates, and used gear for sale. We might even throw in a few luncheon vouchers! Locally grown , organic produce will once again be available on Tybee Island. Mama B's will open this weekend behind High Tide Surf Shop. Store hours are 11-7 for wholesome goodies such as purple carrots, rainbow carrots, fingerling potatoes, red caribe potatoes and 5 varieties of squash! Good luck, Libby.. sounds like a veritable horticultural cacophony for cellular reproduction. The Georgia Sea Turtle Center on Jekyll Island will release two rehabilitated Loggerhead turtles and one Kemp’s Ridley at noon, Friday, May 29th. Satellite tracking devices will be attached to the half shell heros, so you’ll be able to go to georgiaseaturtle-center.org and track them online! If you have not yet been to the Turtle Rehab Center, then it should be on your top ten list for this summer. Hopefully the release will be less of a 'bells and whistles' publicity frenzy of Tybee's turtle release last year. Open House at the Dhamma Center will be taking place this Sunday from 1-5pm. There is no greater asset to the planet than a self realized human being, but maintaining an open channel between mind, body and spirit is hard bloody work. The South East Vipassana Center can help and runs 10 day meditation courses to kick start you on the right track. Highly recommended. No bells and whistles, just inner peace. The very showy Tibetan Monks will be in town next week to coincide with the Asian festival. The holy bros will be throwing down a 'Sita Tara' Sand Mandala at the Telfair Museum. Sita Tara is a form of enlightened feminine Buddha and her specific energy has to do with longevity, good health, and prosperity (there's always a hidden agenda with the TM's). From Monday to Friday, it's free and awesome, but don't tell the curator it's going to be dumped in the river on Friday! 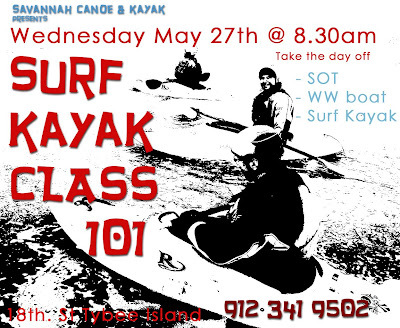 Oh yes, Sea Kayak Intro Class on Saturday - lots of sand, chance of turtles, totally organic, and always fun. We have had a few sitings of sea turtles on our trips in the last couple of weeks and the first sea turtle nests of the year in coastal Georgia have been recorded. Biologists are encouraged by last year's nesting season with a record 1,646 nests recorded on the Georgia coast. With anywhere from 40-70,000 nests, Florida accounts for more than 90 percent of loggerhead nesting in the United States. Although loggerhead sea turtles nest at many locations around the world, nearly 90 percent of the world's population is believed to nest on the beaches of Florida and Oman (on the Arabian Peninsula). The Georgia Department of Natural Resources said the first leatherback sea turtle nest of the season was found last week on Sea Island. Volunteers discovered the first loggerhead sea turtle nest on Wassaw Island over the weekend. Mark Dodd, the DNR sea turtle program coordinator, said he's hoping 2009 will be an above average nesting season. The season starts May 1st and goes through September. Collisions with boats are the most common identifiable cause of trauma in sea turtles that wash up dead on beaches. Tammy S., our Little Tybee turtle monitor, towed back a rather large dead turtle last week, thought to be the victim of a boat strike. Five sea turtle species are found in Georgia waters. All of them are protected by state and federal law.
. The Gray's Reef Data Buoy, washed ashore last week on Cumberland Island, about 5o miles Southwest of where it should be . Photo by Carol R.
The Us Wave Ski Nationals will be held at Sebastian Inlet in Florida this year and Savannah Canoe & Kayak are one of the chief sponsors of the event. Come the first weekend of October 2 -4th, we will be set up on the beach with a display of Tiderace Sea Kayaks and Mega Surf Kayaks. Sebastian Inlet, a point break, has some of the best and most consistent surf on the East coast and this is the first paddle surf competition to be held there. More details about this evolving event will be announced soon. 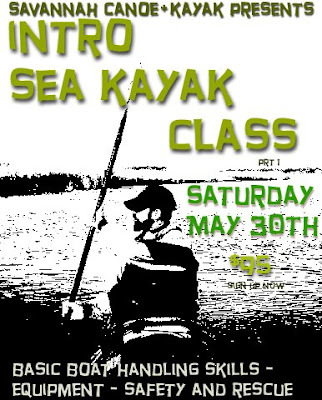 The essential introduction for all local paddlers and enthusiasts. 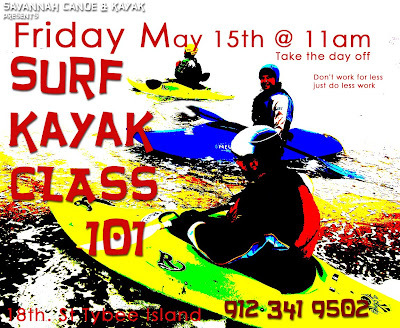 After ten years of teaching the local paddling community we know what makes a fun, interesting and challenging class. This year Surf Camp promises to be better, not bigger than last year's very successful workshop. 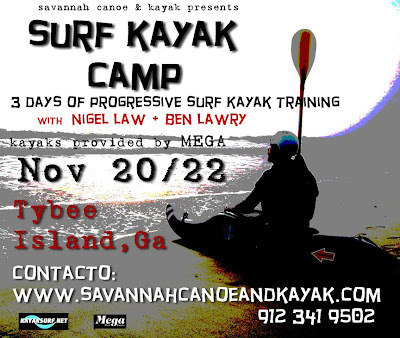 Come spend three days in the off season and increase your level of expertise in SOT, WW boat, Ski and Surf Kayak. We'll take care of you. Just in Case it Stops Raining..
. Ifyou don't already have one of these, $75 dollars will secure your barrel along with all the 'rocket science' on how to put it together. If you have been wondering why there is not data coming through from the Grays Reef buoy, it's because it is beached on Cumberland Island. 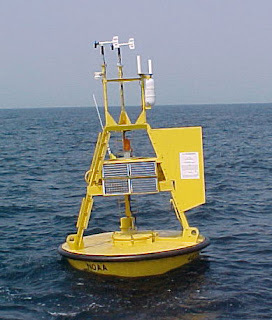 The last readings from this very expensive piece of equipment showed close proximity wave heights at 14ft. before being ripped from its mooring . Carol on Cumberland found the buoy while on turtle patrol. No telling when this important station will be re attached as funding for many of these costly research data stations is on the line.
. TideRace Xcite with a Mega Bullitt S on the side. No more excuses. 100% satisfaction guaranteed. News Round Up - This Week. A Long Wet Week it was, kicked off by storms and a cold front Sunday afternoon. Heavy winds and cold temps disrupted all arms of our programming for two days. Then, on Wednesday a tropical storm moved up and in, and the rains blanketed the SE until today. Even Space Shuttle was ordered 'once more around the block', unable to land at The Cape. A Couple of Witless Pratts from Hinesville kidnapped five turtles from the Tybee Marine Center. Working as a team, the naughty naturalist distracted the staff with genuine questions about how to care for the terrapins, while surreptitiously removing the slow thinking critters form their tank. The bungling biologists were very soon afterwards found on the beach, and four of the five turtles were recovered. Felony charges are pending. Miley Vyrus Coming to Tybee. Come June, the world of Hollywood and all the madness that follows will descend on Tybee for three months of filming. is the premis for the latest dross from Disney world. The production, originally scheduled to be filmed on Wrightsville Beach N.C is expected to do for Tybee what ' The Garden' did for Savannah. Be careful what you wish for Tybee! The Kody Brothers played to a packed porch Wednesday evening at Zacs ' I'm leaving again' party. Hosted by SC&K guides Nick & Steph, the small and intimate gathering was a veritable feast of fine vitalls, conversation and musical jams. Since arriving back in town this last winter, after completing the Appalachian Trail, Zac has discovered that home ain't going anywhere and there's a whole world out there just waiting to wise him up. 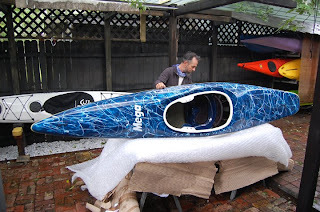 New Boats Arrived from Mega yesterday. We are now once again fully stocked with the latest and best surf machines in the world. We have a very hot X Tech Bullitt S as well as a good stock of Merlins and Neutrons and a very hot Scarab. Call for a demo or to make an appointment to view and smell these vessels. 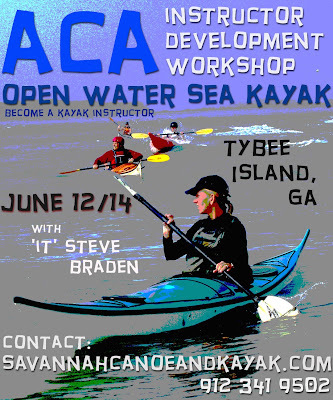 Three days to improve your paddling skills and work on your teaching and presentation ability. Reservations being taken now. Deadline is June 1st. The American Diabetes Associations fall campaign takes on a new twist with three exciting events all on one day. The kick-off announcing the new signature event will be on Wednesday, May 20 at 5:30 p.m. poolside at The Savannah Hilton DeSoto on Liberty Street in Savannah. Campaign chairman Ken Gaylord, First Chatham Bank, will introduce the event directors for each activity and plans for the festival will be announced to the public. The chairs for the additional events are: Tony Eichholz, Byck Management, Tour de Cure and David Mason, Lorwil Land Corporation, Kayak for a Kure. Kayak professional, Barry Shrum, will also be performing kayak maneuvers to generate excitement about the kayak portion of the event. On Saturday, October 17, walkers, cyclists and kayakers will convene at the UGA Marine Extension Service Aquarium grounds for the Sunsplash Outdoor Fitness Festival following a morning of three fitness activities. Diabetes is the 5th leading cause of death by disease and claims over 225,000 American lives annually. Improved nutrition, increased physical activity and awareness of risk factors can completely prevent Type 2 diabetes, the most common form of the disease. Risk factors include being over age 45, being overweight, sedentary, and having a family history of diabetes. African Americans, Latinos, Native Americans, Asians and Pacific Islanders are at an increased risk, as are women who have had babies weighing more than nine pounds at birth. The first day of summer doesn't officially come until June 20, but Tybee Island residents launch the summer beach season this Friday with the 21st annual Beach Bum Parade. 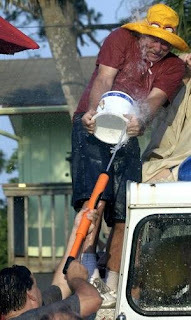 The biggest water fight east of the Mississippi kicks off at 6pm and if you are on the island you are fair game for a good hosing. An unsuspecting tourist once cruising in his open top Corvette was severely douched while waiting at Chus stop light. It is a douse fest that starts near the Tybee Island Lighthouse and ends at the 18th Street parking lot at the Pier and Pavilion. Spectators, lined up along the parade route on Butler Avenue, are armed with buckets, squirt guns and hoses. Music and beer to follow. Get Prepped for the Weekend. About a month ago, on one of our trips whilst hiking the beach on Little Tybee, we came across this rather gruesome discovery. 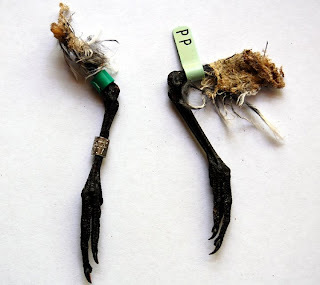 A pair of legs, no less was all that remained of something's lunch time snack. Or was it something far more sinister? Foul play possibly? The legs were banded and printed with a phone number, so upon getting home we called it in. Just this week we received some information on the legs' owner. They belonged to a Red Knot, born in 2002 and banded in Stone Harbour, New Jersey. The Red Knot is the largest of the "peeps" in North America, and one of the most colorful. It makes one of the longest yearly migrations of any bird, traveling 15,000 km (9,300 mi) from its Arctic breeding grounds in the north to Tierra del Fuego in southe rn South America. But not this one. In fact the Red Knot is on the verge of extinction. Delaware Bay is an important staging area during spring migration, where the knots feed on the eggs of spawning horseshoe crabs. It is estimated that nearly 90 percent of the entire population of the Red Knot subspecies C. c. rufa can be present on the bay in a single day. The reduction in food available to the knots because of the heavy harvesting of horseshoe crabs may be responsible for a decline in Red Knot populations. For more information about this great little peeper click here . More body part identification coming soon! In a statement issued earlier today Savannah Canoe and Kayak said they would most definitely not be asking staff to take a pay cut. "We view this current trend as unethical and anti American." said a spokesperson not authorized to speak to the press. "The Workers are not responsible for the over spending regimes of middle management and above. Being in business in the private sector is all about riding the ups and downs, but wages should stay the same regardless. Down with upper management ! Down with Banks. Down with Georgia Tourist Board. Power to the people". We had a great time in old Blighty, but now we are back and ready for action...after we take another nap, that is.. New Mega kayaks should be here in about a week. We also have signed copies of Simon Hammonds surf kayak book. Wow !..it got hot ! This Weekend-Oyster Reefing- A Blast ! 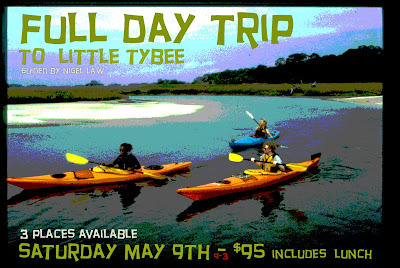 We will be planting the oyster reef on Tybee again this Saturday, May 9th. We will meet at 1:00 pm at the 'boat loading site' (map). You will need to bring your sunscreen, bug repellent, change of clothes, and shoes with laces :-) We will provide the gloves, water and snacks. Also, I'm working on a carpool system from Brunswick so that volunteers can ride up together in the UGA van if they are interested in doing so.Everyone who has joined us has had a blast!! It is a lot of fun to work in the creek- we see all kinds of creatures (sea turtles, coral whips, egrets, whelk egg cases, flounder, etc.) while arranging oyster shell bags on the banks. 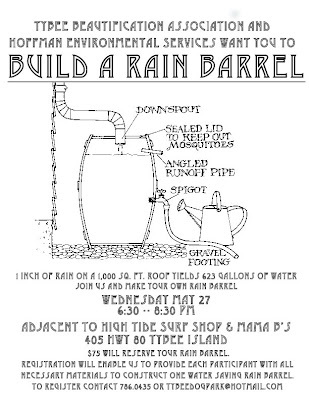 It is also an opportunity to get outside and get dirty while helping out our coastal environment. There are pictures of past reef plantings embedded in our map. Please RSVP to me via email by 5 PM Friday if you would like to join us, and I will then send you complete details on where to park, what to expect, what to bring, etc. I have been trying for over a year to get into a Surf Coach 3 or 5 star surf class. These classes are not in high demand and since the BCU restructured all of it's levels, it seemed as though 5 star surf had been conveniently lost. But there is a curriculum, and who better to teach surfing at the highest level than Simon Hammond, coach to the English and Northern Irish teams and the '03 World Champion (at Easky). As an instructor and instructor trainer, one of the things I like most about my job is taking classes from other coaches. It's not that anybody is teaching anything very different or revolutionary, and I don't expect to learn a lot technically, but I do like to see and experience the components, pace, logistics, and overall presentation of any coach's delivery. I find this especially helpful with surf classes. Teaching someone to surf in a safe, progressive, and challenging environment is not easy. Paddle surfing is a skill based activity that requires a lot of practice and repetition in an ever changing environment. Over the years, as well as teaching many surf classes, I have taken part in classes and workshops with the likes of Nigel Foster, Nigel Robinson, Berty, Ben Lawry, Spencer Cooke, Philip Aschliman, and now Simon. They all cover a wide spectrum of styles in both surfing and teaching. I have come away from each of them with a small gem of awesome surfing knowledge, but ultimately, and more importantly, a much deeper understanding of the sport and culture of paddle surfing. It seems like a long way to go for a class, but of course it's not... like we really need an excuse to travel to another country to go surfing! It's all part of the futility of the obsession that we imperfect humans crave. The wind dropped off to a 'light on-shore' in the night. A heavy ground swell rolled in and the waves the next morning were very big with a short swell period. They would break simultaneously in both directions, creating a huge white foamy soup zone that looked more like very deep powder snow running parallel to the rocky shoreline as far as the eye could see. I figured Simon would have a suitable spot where we would have a fighting chance to actually learn something. He did. 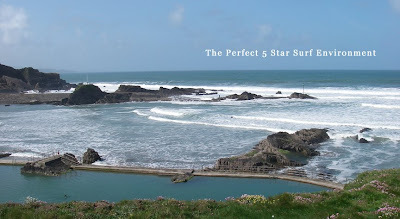 "This is a classic 5 star location", Simon told us as we stood on the cliff looking over the entrance to Bude Harbour. There were three of us in the class and all of a similar level. We surfed three sessions between tea and pasties at two different spots. We worked on simple technique to improve our understanding and ability to formulate maneuvers and tricks. Simon was fantastic to watch and surfed a lot in the morning. 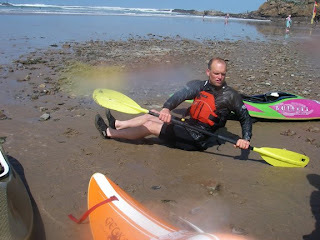 As the tide ebbed he spent more time on the beach while we practised paddle out take offs, top turns, and pivot turns. It was the perfect day after a lot of travel, planning, and logistics. The sun shone and the craving was once more satisfied. Full Day Trip Next Weekend. A thundering ground swell over the weekend gave us conditions above and beyond the 5 star requirements. It was an awesome day of surfing with the 2003 world champion and local Cornish lad, Simon Hammond. Full report and video coming next week.